The EOS Mainnet is Live! 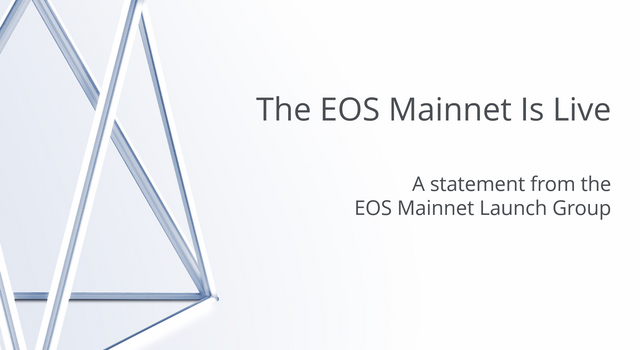 This is a joint statement from the EOS Mainnet Launch Group (EMLG). Look for at least five Block Producers you trust to have published this statement for it to be considered valid. Over the past year, a global community has united itself under the goal of launching the EOS mainnet. Today, we are pleased to announce that blocks are flowing, voting is live, and that we have succeeded. For the chain to be considered valid, 15% percent of all tokens must stake a vote for a Block Producer Candidate. This process could take hours to days. Remember to be smart and vigilant when it comes to using your EOS private key. As a group, the EMLG recommends using ‘cleos’, the voting command line tool developed by Block.One, as no other tools have undergone third party security audits at this time. Individual Block Producers and community members have developed their own voting tools as well, please reach out to Block Producers you trust for a list of the tools they individually approve of. This has been an incredible journey for us all and it’s just the beginning. EOS will only be as valuable as what we build on top of it. So let’s build something amazing, together. Woohoo!!! I hope you all get some very well earnt sleep soon! What an amazing effort! Congratulations!